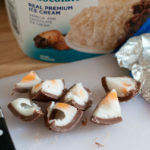 After the initial failure of the Cadbury Crème Egg Cookies, you’d think we’d give up on repurposing these springtime treats. But no! It just made us more dogged about creating a great crème egg recipe. Now that the chocolatey capsules of ooey gooey goodness are in the stores – weeks before Valentine’s Day, no less! 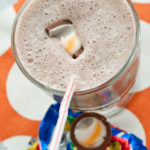 – it’s time we shared our second experiment: The Cadbury Crème Egg Milkshake. We froze a few Cadbury eggs beforehand. Add a couple of scoops of your favorite ice cream to the blender – we chose chocolate – and blend with milk to desired consistency. Then add a quartered frozen Cadbury egg and blend again. 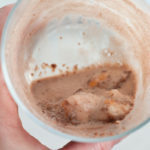 THE VERDICT: It was a good chocolate milkshake! But the sweet crème of the crème egg didn’t shine through. Perhaps vanilla or another flavor of ice cream would have helped the egg’s flavors stand out. Why did we post another kitchen (semi-)failure? If you remember the “fauxnuts” we made last year, there’s always a lesson to be learned in the kitchen. With the crème eggs, we learned more about texture and tastes and how to better use ingredients that complement – not compete – with each other. Have you ever baked with Easter candy? What are the biggest lessons you learned in the kitchen by making mistakes?